Listen to the rich sound and wonderful tone of this completely restored Steinway 7'4" model C. This beautiful Rosewood satin finish piano with original ivory keys, serial #49927, was built in 1881. Piano restoration by Reeder Pianos, Inc. This 1970 Mason & Hamlin was fully restored by Reeder Pianos, and is a fine example of the rich tone and full bass that the Mason pianos are known for. It was used for many years in a concert hall, and has regained its beautiful sound once again. Listen for yourself to this 9' for the clear, brilliant tone. The Mason & Hamlin piano is known for its rich, full bass. This model CC 9'4" concert grand is no exception. In fact, it is exceptional. This beautiful Ebony Satin finished Mason, serial #15745, was built in 1905. Completely restored by Reeder Pianos, Inc.
One of our favorites on our showroom floor, this Blüthner Model 6 Mahogany Polish 6'3" grand is in perfect condition and sings beautifully. Listen for the signature Blüthner golden tone present in this preowned instrument. Build in 1991, it has been lovingly cared for and you can tell. It is a beauty, and it is available for purchase! The Westminster Presbyterian Church had a Piano Dedication Concert for the restored Steinway B they purchased. It is a great piano. A positive review from the July 2014 Acoustic & Digital Piano Buyer about the Blüthner e-Klavier digital pianos. https://www.pianobuyer.com/Articles/Detail/ArticleId/173/REVIEW-BLUTHNER-e-KLAVIER. Elmer Reeder and his brother purchased a sawmill outside of Lansing, Michigan, right after World War II. It was during that time that Elmer became an expert in wood, an important part of his career years later. When his son, Jim, opened a piano shop and retail store called James Reeder Pianos, Elmer was hired by his son to become a piano builder. Elmer worked on construction and rebuilding pianos and in fact continued to work in the shop well into his 90s. 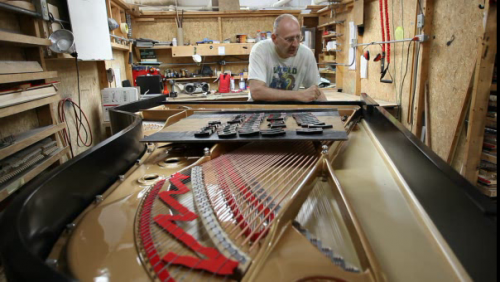 James Reeder is the piano technician who formed James Reeder Piano in Lansing, Michigan, as both a repair and retail business. With a strong background in the restoration of pianos, Jim sought to hire top craftsmen to create the best service possible. Among those he hired was his father, who had a background in woodworking. As a retailer, Jim began as a Steinway dealer and over the years he became the authorized dealer for the Blüthner Piano as well as Mason & Hamlin Pianos. His focus has always been to provide the best sound possible out of each piano and match those qualities up with the customer's needs. This attention to customer service has been a key element of his success and his own enjoyment in the work he does. There was a scene from the movie Buffalo filmed in our showroom. Piano courtesy of Blüthner and James Reeder Pianos. This is a Blue Griffin production, recorded, filmed and edited by Sergei Kvitko.